Oracle BPM is build upon the same Oracle Fusion Middleware infrastructure as Oracle SOA Suite and therefor integrates with many of it components. One of these components, Oracle BAM, can be used for business activity monitoring. But Oracle BPM comes with some integrated features for process analytic purposes as well. Below picture shows an high level overview of the flows of these metrics through the Oracle Fusion Middleware infrastructure for BPM/SOA & BAM. Real-time dashboards: The role for BAM is allowing real-time dashboards to get “RIGHT NOW” insight in your organizations processes. The “enable BAM” option allows you to send metrics to the Oracle BAM adapter which stores them in the ORABAM schema. These metrics will be the primary source for your Oracle BAM Active Data Cache (BAM ADC). The BAM ADC is designed and optimized to handle large amounts of data in real time. Data coming into Oracle BAM ADC immediately updates all defined calculations and aggregates in real time in an in-memory cache so that this data can be pushed as quickly as possible to Oracle BAM dashboards and reports (quote: Oracle). 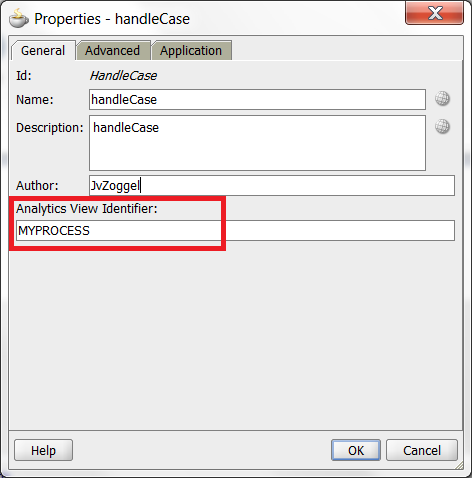 How to configure BAM for BPM is documented by Aldo Schaap in this blogpost. 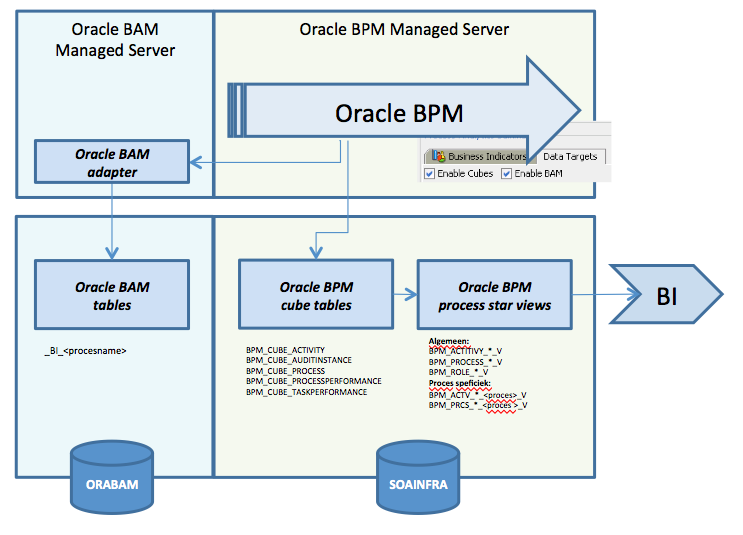 Oracle BAM is a good extension for the BPM infrastructure to get . 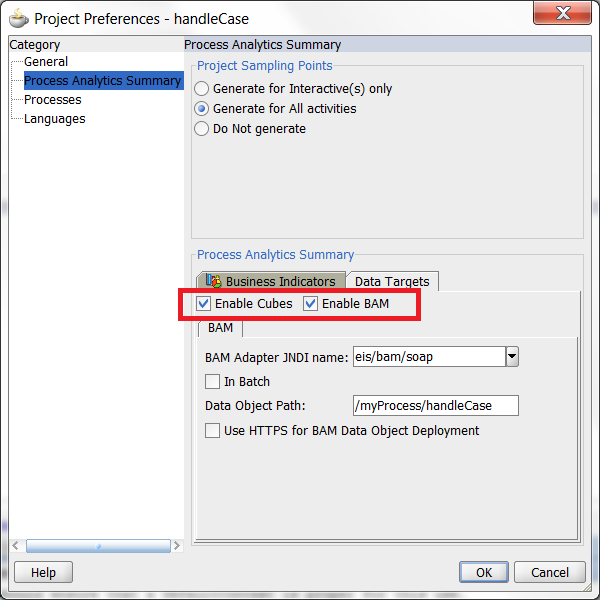 Business Intelligence (BI): The Enable Cubes setting has another important but different function. When enabling this setting the Oracle BPMN Engine will start storing the business indicators of the process into the CUBE tables in your SOAINFRA schema. These CUBE tables are full with references, hardly readable, considered internal SOAINFRA infrastructure and better left alone. However they are the source for the Oracle Process Star schema views. These process views are perfectly documented by Oracle and will probably be the most important source for your Business Intelligence (BI) information. The views are based upon the CUBE tabels and show the overlapping result of all analytic information from all of your processes. Because many of the processes will have different business indicators, almost none of the views above will have specific custom information (your own metrics) available. To solve this problem, Oracle has added something in BPM version 11.1.1.7 (PS6). We now have an additional configuration option for our processes during design time. By configuring the Analytics View Identifier the BPM infrastructure this will create views for the specific process with the name mentioned in the Analytic View Identifier. After deploying the BPM application you will find the new database analytics views generated in your SOAINFRA schema. These specific views will contain the named columns for the business indicators you configured in your process. This is an excellent out-of-the-box mechanism to publish your business intelligence information with custom metrics without having to create custom views yourself on the internal cubes. Since you most likely don’t want to store this information in the SOAINFRA schema for decades, it’s best to create a strategy to extract the necessary information to a simple separate database (warehouse) or a Business Intelligence solution. 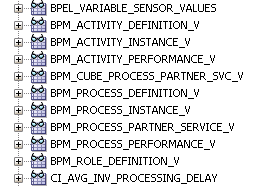 When you do a redeployment of your BPM project, and decide to leave the “keep running instances on after redeployment” not selected, your process information will be removed from the cubes. As a result your BI views will show no historical information anymore. So watch out for this in production. 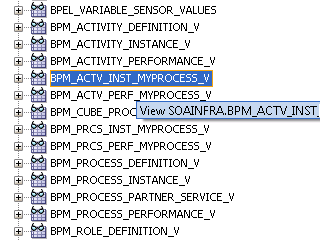 The generic Oracle BPM process star views are always available in SOAINFRA, however the process specific views created due to the analytics view identifier are not (as mentioned earlier). When you redeploy your BPM process (no matter what selection you made mentioned here above regarding keeping instances), your process specific views will be dropped, and recreated. Which is not unexpected due to the fact the view will hold specific columns based on the metrics in your process and can’t keep track of the changes in JDeveloper. However this is a bit annoying when you have created grants on these SOAINFRA views to access them from another schema.